You are currently browsing the category archive for the ‘sophistry’ category. Network deconvolution was claimed to be applicable to any network when it was published. At the time, Feizi stated that “We applied it to gene networks, protein folding, and co-authorship social networks, but our method is general and applicable to many other network science problems.” A promising claim, but in reality it is difficult to beat the nonsense law: Nonsense methods tend to produce nonsense results. The Feizi et al. 2013 paper now has 178 citations, most of them drive by citations. Interestingly this number, 178 is exactly the number of citations of the Barzel et al. 2013 network nonsense paper, which was published in the same issue of Nature Biotechnology. Presumably this reflects the fact that authors citing one paper feel obliged to cite the other. These pair of papers were thus an impact factor win for the journal. For the first authors on the papers, the network deconvolution/silencing work is their most highly cited first author papers respectively. Barzel is an assistant professor at Bar-Ilan University where he links to an article about his network nonsense on his “media page”. Feizi is an assistant professor at the University of Maryland where he lists Feizi et al. 2013 among his “selected publications“. Kellis teaches the “network deconvolution” and its associated nonsense in his computational biology course at MIT. And why not? These days truth seems to matter less and less in every domain. A statement doesn’t have to be true, it just has to work well on YouTube, Twitter, Facebook, or some webpage, and as long as some people believe it long enough, say until the next grant cycle, promotion evaluation, or election, then what harm is done? A win-win for everyone. Except science. The two volcano plots show the log-fold change in abundance estimated for samples sequenced by Boj et al. 2015, plotted against p-values obtained with the program limma-voom. I repeat: the plots were made with quantifications from two different RNA-Seq programs. Details are described in the next section, but before reading it first try playing spot the difference. 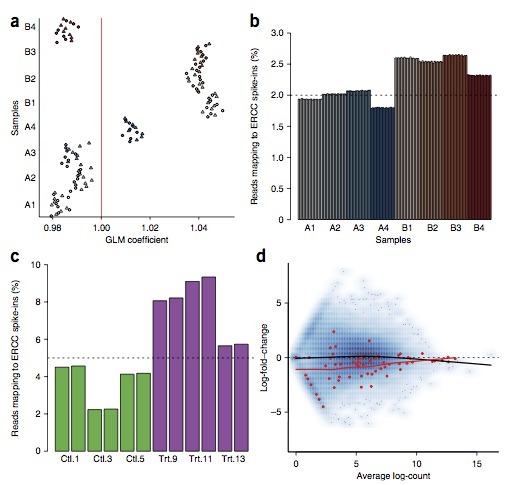 Near-optimal probabilistic RNA-Seq quantification by Nicolas Bray, Harold Pimentel, Páll Melsted and Lior Pachter, Nature Biotechnology 34 (2016), 525–527. Salmon provides fast and bias-aware quantification of transcript expression by Rob Patro, Geet Duggal, Michael I. Love, Rafael A. Irizarry and Carl Kingsford, Nature Methods 14 (2017), 417–419. Patro et al. 2017 claim that “[Salmon] achieves the same order-of-magnitude benefits in speed as kallisto and Sailfish but with greater accuracy”, however after being unable to spot any differences myself in the volcano plots shown above, I decided, with mixed feelings of amusement and annoyance, to check for myself whether the similarity between the programs was some sort of fluke. Or maybe I’d overlooked something obvious, e.g. the fact that programs may tend to give more similar results at the gene level than at the transcript level. Thus began this blog post. In the figure below, made by quantifying RNA-Seq sample ERR188140 with the latest versions of the two programs, each point is a transcript and its coordinates are the estimated counts produced by kallisto and salmon respectively. For context, the Spearman correlation between kallisto and a truly different RNA-Seq quantification program, RSEM, is 0.8944941. At this point I have to say… I’ve been doing computational biology for more than 20 years and I have never seen a situation where two ostensibly different programs output such similar results. Amazingly, kallisto and Salmon-Quasi (the latest version of Salmon) are the two closest programs to each other in the entire comparison, producing output even more similar than the same program, e.g. Cufflinks or StringTie run with different alignments! This raises the question of how, with kallisto published in May 2016 and Salmon kallisto, Patro et al. 2017 was published in one of the most respected scientific publications that advertises first and foremost that it “is a forum for the publication of novel methods and significant improvements to tried-and-tested basic research techniques in the life sciences.” ? Figure 1c from Patro et al. 2017. At a false discovery rate of 0.01, the authors claim that in a simulation study where ground truth is known Salmon identifies 4.5 times more truly differential transcripts than kallisto! This can explain how Salmon was published, namely the reviewers and editor believed Patro et al.’s claims that Salmon significantly improves on previous work. In one analysis Patro et al. provide a p-value to help the “significance” stick. They write that “we found that Salmon’s distribution of mean absolute relative differences was significantly smaller (Mann-Whitney U test, P=0.00017) than those of kallisto. But how can the result Salmon >> kallisto, be reconciled with the fact that everybody repeatedly finds that Salmon kallisto? In a differential expression analysis billed as “a typical downstream analysis” Patro et al. did not examine differential expression results for a typical biological experiment with a handful of replicates. Instead they examined a simulation of two conditions with eight replicates in each. The large number of replicates allowed them to apply the log-ratio t-test directly to abundance estimates based on transcript per million (TPM) units, rather than estimated counts which are required for methods such as their own DESeq2. The simulation involved generation of GC bias in an approach compatible with the inference model, with one batch of eight samples exhibiting “weak GC content dependence” while the other batch of eight exhibiting “more severe fragment-level GC bias.” Salmon was run in a GC bias correction mode. Figure 2 from Schurch et al. 2016. The four vertical panels show FPR and TPR for programs using 3,6,12 and 20 biological replicates (in yeast). Details are in the Schurch et al. 2016 paper. The log-ratio t-test performs poorly not only when the number of replicates is small and regularization of variance estimates is essential. Schurch et al. specifically recommend DESeq2 (or edgeR) when up to 12 replicates are performed. In fact, the log-ratio t-test was so bad that it didn’t even make it into their Table 2 “summary of recommendations”. This recommendation has been codified in a detailed RNA-Seq tutorial where M. Love et al. write that “This [Salmon + tximport] is our current recommended pipeline for users”. do not perform differential expression with a log-ratio t-test. Turning to Patro et al.‘s choice of units, it is important to note that the requirement of shrinkage for RNA-Seq differential analysis is the reason most differential expression tools require abundances measured in counts as input, and do not use length normalized units such as Transcripts Per Million (TPM). In TPM units the abundance for a transcript t is where are the estimated counts for transcript t, is the (effective) length of t and N the number of total reads. Whereas counts are approximately Poisson distributed (albeit with some over-dispersion), variance estimates of abundances in TPM units depend on the lengths used in normalization and therefore cannot be used directly for regularization of variance estimation. Furthermore, the dependency of TPM on effective lengths means that abundances reported in TPM are very sensitive to the estimates of effective length. This is why, when comparing the quantification accuracy of different programs, it is important to compare abundances using estimated counts. This was highlighted in Bray et al. 2016: “Estimated counts were used rather than transcripts per million (TPM) because the latter is based on both the assignment of ambiguous reads and the estimation of effective lengths of transcripts, so a program might be penalized for having a differing notion of effective length despite accurately assigning reads.” Yet Patro et al. perform no comparisons of programs in terms of estimated counts. A Venn diagram showing the overlap in genes predicted to be differential expressed by kallisto (blue) and Salmon (pink). Differential expression was performed with DESeq2 using transcript-level counts estimated by kallisto and Salmon and imported to DESeq2 with tximport. Salmon was run with GC bias correction. This example provides Salmon the benefit of the doubt- the dataset was chosen to be older (when bias was more prevalent) and Salmon was not run in default mode but rather with GC bias correction turned on (option –gcBias). When I saw these numbers for the first time I gasped. Of course I shouldn’t have been surprised; they are consistent with repeated published experiments in which comparisons of kallisto and Salmon have revealed near identical results. And while I think it’s valuable to publish confirmation of previous work, I did wonder whether Nature Methods would have accepted the Patro et al. paper had the authors conducted an actual “typical downstream analysis”. The distribution of abundances (in TPM units) as estimated by kallisto (blue circles) and Salmon (red stars). The blue circles correspond to kallisto and the red stars inside to Salmon. With the latest version of Salmon the similarity is even higher than what Majoros et al. observed! The Spearman correlation between kallisto and Salmon with TPM units is 0.9899896. A Venn diagram showing the overlap in transcripts predicted by kallisto and Salmon to have estimated abundance > 1 TPM. The figures above were made with Salmon 0.8.2 run in default mode. The correlation between kallisto and Salmon (in TPM) units decreases a tiny amount, from 0.9989224 to 0.9974325 with the –gcBias option and even the Spearman correlation decreases by only 0.011 from 0.9899896 to 0.9786092. I think it’s perfectly fine for authors to present their work in the best light possible. What is not ok is to deliberately hide important and relevant truth, which in this case is that Salmon kallisto. First, Salmon with –gcBias is considerably slower than default Salmon. Furthermore, there is a rapid decrease in performance gain with increasing number of threads, something that should come as no surprise. It is well known that quantification can be I/O bound which means that at some point, extra threads don’t provide any gain as the disk starts grinding limiting access from the CPUs. So why did Patro et al. choose to benchmark runtime with 30 threads? In other words, not only is Salmon kallisto in accuracy, but contrary to the claims in Patro et al. 2017, kallisto is faster. This result is confirmed in Table 1 of Sarkar et al. 2017 who find that Salmon is slower by roughly the same factor as seen above (in the table “quasi-mapping” is Salmon). Having said that, the speed differences between kallisto and Salmon should not matter much in practice and large scale projects made possible with kallisto (e.g. Vivian et al. 2017) are possible with Salmon as well. Why then did the authors not report their running time benchmarks honestly? The Patro et al. 2017 paper uses the term “quasi-mapping” to describe an algorithm, published in Srivastava et al. 2016, for obtaining their (what turned out to be near identical to kallisto) results. I have written previously how “quasi-mapping” is the same as pseudoalignment as an alignment concept, even though Srivastava et al. 2016 initially implemented pseudoalignment differently than the way we described it originally in our preprint in Bray et al. 2015. However the reviewers of Patro et al. 2017 may be forgiven for assuming that “quasi-mapping” is a technical advance over pseudoalignment. The Srivastava et al. paper is dense and filled with complex technical detail. Even for an expert in alignment/RNA-Seq it is not easy to see from a superficial reading of the paper that “quasi-mapping” is an equivalent concept to kallisto’s pseudoalignment (albeit implemented with suffix arrays instead of a de Bruijn graph). Nevertheless, the key to the paper is a simple sentence: “Specifically, the algorithm [RapMap, which is now used in Salmon] reports the intersection of transcripts appearing in all hits” in the section 2.1 of the paper. That’s the essence of pseudoalignment right there. The paper acknowledges as much, “This lightweight consensus mechanism is inspired by Kallisto ( Bray et al. , 2016 ), though certain differences exist”. Well, as shown above, those differences appear to have made no difference in standard practice, except insofar as the Salmon implementation of pseudoalignment being slower than the one in Bray et al. 2016. Things which equal the same thing are also equal to each other. While Salmon is now producing almost identical output to kallisto and is based on the same principles and methods, this was not the case when the program was first released. The history of the Salmon program is accessible via the GitHub repository, which recorded changes to the code, and also via the bioRxiv preprint server where the authors published three versions of the Salmon preprint prior to its publication in Nature Methods. The first preprint was published on the BioRxiv on June 27, 2015. It followed shortly on the heels of the kallisto preprint which was published on May 11, 2015. However the first Salmon preprint described a program very different from kallisto. Instead of pseudoalignment, Salmon relied on chaining SMEMs (super-maximal exact matches) between reads and transcripts to identifying what the authors called “approximately consistent co-linear chains” as proxies for alignments of reads to transcripts. The authors then compared Salmon to kallisto writing that “We also compare with the recently released method of Kallisto which employs an idea similar in some respects to (but significantly different than) our lightweight-alignment algorithm and again find that Salmon tends to produce more accurate estimates in general, and in particular is better able [to] estimate abundances for multi-isoform genes.” In other words, in 2015 Patro et al. claimed that Salmon was “better” than kallisto. If so, why did the authors of Salmon later change the underlying method of their program to pseudoalignment from SMEM alignment? Inspired by temporal ordering analysis of expression data and single-cell pseudotime analysis, I ran all the versions of kallisto and Salmon on ERR188140, and performed PCA on the resulting transcript abundance table to be able to visualize the progression of the programs over time. The figure below shows all the points with the exception of three: Sailfish 0.6.3, kallisto 0.42.0 and Salmon 0.32.0. I removed Sailfish 0.6.3 because it is such an outlier that it caused all the remaining points to cluster together on one side of the plot (the figure is below in the next section). In fairness I also removed one Salmon point (version 0.32.0) because it differed substantially from version 0.4.0 that was released a few weeks after 0.32.0 and fixed some bugs. Similarly, I removed kallisto 0.42.0, the first release of kallisto which had some bugs that were fixed 6 days later in version 0.42.1. Evidently kallisto output has changed little since May 12, 2015. Although some small bugs were fixed and features added, the quantifications have been very similar. The quantifications have been stable because the algorithm has been the same. On the other hand the Salmon trajectory shows a steady convergence towards kallisto. The result everyone is finding, namely that currently Salmon kallisto is revealed by the clustering of recent versions of Salmon near kallisto. However the first releases of Salmon are very different from kallisto. This is also clear from the heatmap/hierarchical clustering of Sahraeian et al. in which Salmon-SMEM was included (Salmon used SMEMs until version 0.5.1, sometimes labeled fmd, until “quasi-mapping” became the default). A question: if Salmon ca. 2015 was truly better than kallisto then is Salmon ca. 2017 worse than Salmon ca. 2015? Convergence of Salmon and Sailfish to kallisto over the course of a year. The x-axis labels the time different versions of each program were released. The y-axis is PC1 from a PCA of transcript abundances of the programs. The bioRxiv preprint server provides a feature by which a preprint can be linked to its final form in a journal. This feature is useful to readers of the bioRxiv, as final published papers are generally improved after preprint reader, reviewer, and editor comments have been addressed. Journal linking is also a mechanism for authors to time stamp their published work using the bioRxiv. However I’m sure the bioRxiv founders did not intend the linking feature to be abused as a “prestamping” mechanism, i.e. a way for authors to ex post facto receive a priority date for a published paper that had very little, or nothing, in common with the original preprint. A comparison of the June 2015 preprint mentioning the Salmon program and the current Patro et al. paper reveals almost nothing in common. The initial method changed drastically in tandem with an update to the preprint on October 3, 2015 at which point the Salmon program was using “quasi mapping”, later published in Srivastava et al. 2016. Last year I met with Carl Kingsford (co-corresponding author of Patro et al. 2017) to discuss my concern that Salmon was changing from a method distinct from that of kallisto (SMEMs of May 2015) to one that was replicating all the innovations in kallisto, without properly disclosing that it was essentially a clone. Yet despite a promise that he would raise my concerns with the Salmon team, I never received a response. At this point, the Salmon core algorithms have changed completely, the software program has changed completely, and the benchmarking has changed completely. The Salmon project of 2015 and the Salmon project of 2017 are two very different projects although the name of the program is the same. While some features have remained, for example the Salmon mode that processes transcriptome alignments (similar to eXpress) was present in 2015, and the approach to likelihood maximization has persisted, considering the programs the same is to descend into Theseus’ paradox. thx! In my case this https://t.co/lA52DhvyOK now pub'd as https://t.co/WcD15p1lrw; just wait a bit longer? The linking of preprints to journal articles is a feature that arXiv does not automate, and perhaps wisely so. If bioRxiv is to continue to automatically link preprints to journals it needs to focus not only on eliminating false negatives but also false positives, so that journal linking cannot be abused by authors seeking to use the preprint server to prestamp their work after the fact. Despite the claim in the Sailfish abstract that “Sailfish provides quantification time…without loss of accuracy” and Figure 1 from the paper showing Sailfish to be more accurate than RSEM, we felt that the shredding of reads must lead to reduced accuracy, and we quickly checked and found that to be the case; this was later noted by others, e.g. Hensman et al. 2015, Lee et al. 2015). After reflecting on the Sailfish paper and results, Nicolas Bray had the key idea of abandoning alignments as a requirement for RNA-Seq quantification, developed pseudoalignment, and later created kallisto (with Harold Pimentel and Páll Melsted). In other words, despite a series of confusing statements on the Sailfish GitHub page and an out-of-date description of the program on its homepage, Sailfish in its published form was substantially less accurate and slower than kallisto, and in its current form Sailfish is kallisto. In retrospect, the results in Figure 1 of Patro et al. 2014 seem to be as problematic as the results in Figure 1 of Patro et al. 2017. Apparently crafting computational experiments via biased simulations and benchmarks to paint a distorted picture of performance is a habit of Patro et al. There is a different detail in the Sailfish/Salmon code which is that when skipping forward the suffix array is checked for exact matching on the skipped sequence. kallisto does not have this requirement (although it could). On error-free data these will obviously be identical; on error prone data this may make Salmon/Sailfish a bit more conservative and kallisto a bit more robust to error. Also due to the structure of suffix arrays there is a possible difference in behavior when a transcript contains a repeated k-mer. These differences affect a tiny proportion of reads, as is evident from the result that kallisto and Salmon produce near identical results. That’s a difference of 79,000 out of ~70 million = 0.1%. Until the kallisto program and preprint was published Salmon used SMEMs. Only after kallisto does Salmon change to using kmer cached suffix array intervals. The kallisto preprint did not discuss outputting position as part of pseudoalignment because it was not central to the idea. It’s trivial to report pseudoalignment positions with either data structure and in fact both kallisto and Salmon do. I want to make very clear here that I think there can be great value in implementing an algorithm with a different data structure. It’s a form of reproducibility that one can learn from: how to optimize, where performance gains can be made, etc. Unfortunately most funding agencies don’t give grants for projects whose goal is solely to reproduce someone else’s work. Neither do most journal publish papers that set out to do that. That’s too bad. If Patro et al. had presented their work honestly, and explained that they were implementing pseudoalignment with a different data structure to see if it’s better, I’d be a champion of their work. That’s not how they presented their work. The idea of using the EM algorithm for quantification with RNA-Seq goes back to Jiang and Wong, 2009, arguably even to Xing et al. 2006. I wrote up the details of the history in a review in 2011 that is on the arXiv. kallisto runs the EM algorithm on equivalence classes, an idea that originates with Nicolae et al. 2011 (or perhaps even Jiang and Wong 2009) but whose significance we understood from the Sailfish paper (Patro et al. 2014). Therefore the fact that Salmon (now) and kallisto both use the EM algorithm, in the same way, makes sense. However Salmon did not use the EM algorithm before the kallisto preprint and program were published. It used an online variational Bayes algorithm instead. In the May 18, 2015 release of Salmon there is no mention of EM. Then, with the version 0.4 release date Salmon suddenly switches to the EM. In implementing the EM algorithm there are details that must be addressed, for example setting thresholds for when to terminate rounds of inference based on changes in the (log) likelihood (i.e. determine convergence). This is because one of the things we did is explore the effects of these thresholds, and understand how setting them affects performance. This can be seen also in a legacy redundancy, we have both alpha_change and alpha_change_limit which ended up being unnecessary because they are equal in the program and used on one line. In other words, alpha_limit in kallisto is really 1e-8, and has been all along. The copying of all the details of our program have consequences for performance. In the sample I ran kallisto performed 1216 EM rounds of EM vs. 1214 EM rounds in Salmon. One of the things we did in kallisto is implement a sequence specific bias correction along the lines of what was done previously in Roberts et al. 2011, and later in Roberts et al. 2013. Implementing sequence specific bias correction in kallisto required working things out from scratch because of the way equivalence classes were being used with the EM algorithm, and not reads. I worked this out together with Páll Melsted during conversations that lasted about a month in the Spring of 2015. We implemented it in the code although did not release details of how it worked with the initial preprint because it was an option and not default, and we thought we might want to still change it before submitting the journal paper. This was a random forest bias correction method different from kallisto’s. Note that since our bias correction method was not reported in our preprint, this had to have been copied directly from our codebase and was done so without any attribution. What was stated is “The benchmarks in the kallisto paper *are* made against a very old version of Sailfish” not “were made against”. By the time that was written, it might well have been true. But kallisto was published in May 2015, it benchmarked with the Sailfish program described in Patro et al. 2014, and by 2016 Sailfish had changed completely implementing the pseudoalignment of kallisto. This is from January 23rd, 2016, almost 9 months after kallisto was released, and 3 months before the Sailfish README accused us of not testing the latest version of Sailfish in May 2015. This is the same file where the kallisto thresholds for the EM were copied to. So after copying our entire method, our core algorithm, many of our ideas, specific parameters, and numerous features… really just about everything that goes into an RNA-Seq quantification project, there is an acknowledgment that our machine tolerance threshold was “intelligently chosen”. A reading of the paper reveals that the “5 times more likely to die” risk calculation comes from . The number 9% is the rate of cardiovascular disease observed in 35 non-flight astronauts whereas the number 43% is rate of cardiovascular disease in Apollo lunar astronauts (3 out of 7). In other words, the grandiose claims of the paper are based on three Apollo astronauts dying of cardiovascular disease rather than an expected single astronaut. The National Space Biomedical Research Institute, a non-governmental organization with funding from NASA’s Human Research Program, supported a recent study published in Scientific Reports that looked at the rate of cardiovascular disease among Apollo astronauts. With the current limited astronaut data referenced in the study it is not possible to determine whether cosmic ray radiation affected the Apollo astronauts. This is not the first time NASA has published statements distancing itself from studies it has supported (either directly or indirectly). Following reports that a NASA-funded study found that industrial civilization was headed for irreversible collapse, NASA published a statement making clear it did not support the results of the study. Thank you NASA! You have set a great example in taking ownership of the published work your funding enabled. Hopefully others (NIH!!) will follow suit in publicly disavowing poorly designed underpowered studies that make grandiose claims. Disclosure: I collaborate with NASA scientists, contribute to projects partially funded by NASA, and apply for NASA funding. M. Kellis, B.W. Birren and E.S. Lander, Proof and evolutionary analysis of ancient genome duplication in the yeast Saccharomyces cerevisae, Nature 2004 (hereafter referred to as the KBL paper). Today I am happy to announce the winner of the prize. But first, I want to thank the many readers of the blog who offered comments (>135 in total) that are extraordinary in their breadth and depth, and that offer a glimpse of what scientific discourse can look like when not restricted to traditional publishing channels. You have provided a wonderful public example of what “peer review” should mean. Coincidentally, and to answer one of the questions posted, the blog surpassed one million views this past Saturday (the first post was on August 19th, 2013), a testament to the the fact that the collective peer reviewing taking place on these pages is not only of very high quality, but also having an impact. I particularly want to thank the students who had the courage to engage in the conversation, and also faculty who published comments using their name. In that regard, I admire and commend Joshua Plotkin and Hunter Fraser for deciding to deanonymize themselves by agreeing to let me announce here that they were the authors of the critique sent to the authors in April 2004 initially posted as an anonymous comment on the blog. The discussion on the blog was extensive, touching on many interesting issues and I only summarize a few of the threads of discussion here. I decided to touch on a number of key points made in order to provide context and justification for my post and selection of the prize winner. This comment exemplifies the proclivity of some authors to view publication as the encasement of work in a casket, buried deeply so as to never be opened again lest the skeletons inside it escape. But is it really beneficial to science that much of the published literature has become, as Ferguson and Heene noted, a vast graveyard of undead theories? Surely the varied and interesting comments posted in response to my challenge (totaling >25,000 words and 50 pages in Arial 11 font), demonstrate the value of communal discussion of science after publication. For the record, this past month I did submit a paper and also a grant, and I did spend lots of time with my family. I didn’t practice the guitar but I did play the piano. Yet in terms of research, for me the highlight of the month was reading and understanding the issues raised in the comments to my blog post. Did I have many other things to do? Sure. But what is more pressing than understanding if the research one does is to be meaningful? A few years ago I introduced a new two-semester freshman math course at UC Berkeley for intended biology majors called Math 10- Methods of Mathematics: Calculus, Statistics and Combinatorics“. One of the key ideas we focus on in the first semester is that of a p-value. The idea of measuring significance of a biological result via a statistical computation involving probabilities is somewhat unnatural, and feedback from the students confirms what one might expect: that the topic of p-values is among the hardest in the course. Math for biologists turns out to be much harder than calculus. I believe that at Berkeley we are progressive in emphasizing the importance of statistics for biology majors at the outset of their education (to be clear, this is a recent development). The prevailing state is that of statistical illiteracy, and the result is that p-values are frequently misunderstood, abused, and violated in just about every possible way imaginable (see, e.g., here, here and here). P-values require a null hypothesis and a test statistic, and of course one of the most common misconceptions about them is that when they are large they confirm that the null hypothesis is correct. No! And worse, a small p-value cannot be used to accept an alternative to the null, only to (confidently) reject the null itself. And rejection of the null comes with numerous subtle issues and caveats (see arguments against the p-value in the papers mentioned above). So what is the point? I think the KBL paper makes for an interesting case study of when p-values can be useful. For starters, the construction of a null model is already a useful exercise, because it is a thought experiment designed to test ones understanding of the problem at hand. The senior author of the KBL paper argues that “we were interested in seeing whether, for genes where duplication frees up at least one copy to evolve rapidly, the evidence better fits one model (“Ohno”: only one copy will evolve quickly) or an alternative model (both genes will evolve quickly).” While I accept this statement at face value, it is important to acknowledge that if there is any science to data science, it is the idea that when examining data one must think beyond the specific hypotheses being tested and consider alternative explanations. This is the essence of what my colleague Ian Holmes is saying in his comment. In data analysis, thinking outside of the box (by using statistics) is not optional. If one is lazy and resorts to intuition then, as Páll Melted points out, one is liable to end up with fantasy. The first author of KBL suggests that the “paper was quite explicit about the null model being tested.” But I was unsure of whether to assume that the one-gene-only-speeds-up model is the null based on”we sought to distinguish between the Ohno one-gene-only speeds-up (OS) model and the alternative both-genes speed-up (BS) model” or was the null the BS model because “the Ohno model is 10^87 times more likely, leading to significant rejection of the BS null”? Or was the paper being explicit about not having a null model at all, because “Two alternatives have been proposed for post-duplication”, or was it the opposite, i.e. two null models: “the OS and BS models are each claiming to be right 95% of the time”? I hope I can be forgiven for failing, despite trying very hard, to identify a null model in either the KBL paper, or the comments of the authors to my blog. There is however a reasonable null model, and it is the “independence model”, which to be clear, is the model where each gene after duplication “accelerates” independently with some small probability (80/914). The suggestions that “the independence model is not biologically rooted” or that it “would predict that only 75% of genes would be preserved in at least one copy, and that 26% would be preserved in both copies” are of course absurd, as explained by Erik van Nimwegen who explains why point clearly and carefully. The fact that many entries reached the same conclusion about the suitable null model in this case is reassuring. I think it qualifies as a “reasonable model” (thereby passing the threshold for my prize). One of my favorite missives about p-values is by Andrew Gelman, who in “P-values and statistical practice” discusses the subtleties inherent in the use and abuse of p-values. But as my blog post illustrates, subtlety is one thing, and ignorance is an entirely different matter. Consider for example, the entry by Manolis Kellis who submitted that thus claiming that I owe him 903,659,165 million billion trillion quadrillion quintillion sextillion dollars (even more than the debt of the United States of America). His entry will not win the prize, although the elementary statistics lesson that follows is arguably worth a few dollars (for him). First, while it is true that a p-value can be computed from the (log) likelihood ratio when the null hypothesis is a special case of the alternative hypothesis (using the chi^2 distribution), the ratio of two likelihoods is not a p-value! Probabilities of events are also not p-values! For example, the comment that “I calculated p-values for the exact count, but the integral/sum would have been slightly better” is a non-starter. Even though KBL was published in 2004, this is apparently the level of understanding of p-values of one of the authors, a senior computational biologist and professor of computer science at MIT in 2015. Wow. So what is “the correct” p-value? It depends, of course, on the test statistic. Here is where I will confess that like many professors, I had an answer in mind before asking the question. I was thinking specifically of the setting that leads to 0.74 (or 0.72/0.73, depending on roundoff and approximation). Many entries came up with the same answer I had in mind and therefore when I saw them I was relieved: I owed $135, which is what I had budgeted for the exercise. I was wrong. The problem with the answer 0.74 is that it is the answer to the specific question: what is the probability of seeing 4 or less pairs accelerate out of 76 pairs in which at least one accelerated. A better test statistic was proposed by Pseudo in which he/she asked for the probability of seeing 5% or less of the pairs accelerate from among the pairs with at least one gene accelerating when examining data from the null model with 457 pairs. This is a subtle but important distinction, and provides a stronger result (albeit with a smaller p-value). The KBL result is not striking even forgoing the specific numbers of genes measured to have accelerated in at least one pair (of course just because p=0.64 also does not mean the independence model is correct). What it means is that the data as presented simply weren’t “striking”. One caveat in the above analysis is that the arbitrary threshold used to declare “acceleration” is problematic. For example, one might imagine that other thresholds produce more convincing results, i.e. farther from the null, but of course even if that were true the use of an arbitrary cutoff was a poor approach to analysis of the data. Fortunately, regarding the specific question of its impact in terms of the analysis, we do not have to imagine. Thanks to the diligent work of Erik van Nimwegen, who went to the effort of downloading the data and reanalyzing it with different thresholds (from 0.4 to 1.6), we know that the null cannot be rejected even with other thresholds. There were many entries submitted and I read them all. My favorite was by Michael Eisen for his creative use of multiple testing correction, although I’m happier with the direction that yields $8.79. I will not be awarding him the prize though, because his submission fails the test of “reasonable”, although I will probably take him out to lunch sometime at Perdition Smokehouse. I can’t review every single entry or this post, which is already too long, would become unbearable, but I did think long and hard about the entry of K. It doesn’t directly answer the question of why the 95% number is striking, nor do I completely agree with some of the assumptions (e.g. if neither gene in a pair accelerates then the parent gene was not accelerated pre-WGD). But I’ll give the entry an honorable mention. The prize will be awarded to Pseudo for defining a reasonable null model and test statistic, and producing the smallest p-value within that framework. With a p-value of 0.64 I will be writing a check in the amount of $156.25. Congratulations Pseudo!! One of the most interesting results of the blog post was, in my opinion, the extensive discussion about the truth. Leaving aside the flawed analysis of KBL, what is a reasonable model for evolution post-WGD? I am happy to see the finer technical details continue to be debated, and the intensity of the conversation is awesome! Pavel Pevzner’s cynical belief that “science fiction” is not a literary genre but rather a description of what is published in the journal Science may be realistic, but I hope the comments on my blog can change his mind about what the future can look like. In lieu of trying to summarize the scientific conversation (frankly, I don’t think I could do justice to some of the intricate and excellent arguments posted by some of the population geneticists) I’ll just leave readers to enjoy the comment threads on their own. Comments are still being posted, and I expect the blog post to be a “living” post-publication review for some time. May the skeletons keep finding a way out! Earlier in this post I admitted to being wrong. I have been wrong many times. Even though I’ve admitted some of my mistakes on this blog and elsewhere in talks, I would like to joke that I’m not going to make it easy for you to find other flaws in my work. That would be a terrible mistake. Saying “I was wrong” is important for science and essential for scientists. Without it people lose trust in both. I have been particularly concerned with a lack of “I was wrong” in genomics. Unfortunately, there is a culture that has developed among “leaders” in the field where the three words admitting error or wrongdoing are taboo. The recent paper of Lin et al. critiqued by Gilad-Mizrahi is a good example. Leaving aside the question of whether the result in the paper is correct (there are strong indications that it isn’t), Mizrahi-Gilad began their critique on twitter by noting that the authors had completely failed to account for, or even discuss, batch effect. Nobody, and I mean nobody who works on RNA-Seq would imagine for even a femtosecond that this is ok. It was a major oversight and mistake. The authors, any of them really, could have just come out and said “I was wrong”. Instead, the last author on the paper, Mike Snyder, told reporters that “All of the sequencing runs were conducted by the same person using the same reagents, lowering the risk of unintentional bias”. Seriously? This response, and others by members of the ENCODE consortium upset many people who may struggle to tell apart white and gold from blue and black, but certainly know that white is not black and black is not white. Likewise, I suspect the response of KBL to my post disappointed many as well. For Fisher’s sake, why not just acknowledge what is obvious and true? Science is practiced by human beings. Just like with any other human activity, some of the humans who practice it are ethical while others are not. Some are kind and generous while others are… not. Occasionally scientists are criminal. Frequently they are honorable. Of particular importance is the fact that most scientists’ behavior is not at any of these extremes, but rather a convex combination of the mentioned attributes and many others. In science it is people who benefit, or are hurt, by the behavior of scientists. Preprints on the bioRxiv do not collect salaries, the people who write them do. Papers published in journals do not get awarded or rejected tenure, people do. Grants do not get jobs, people do. The behavior of people in science affects… people. Some argue for a de facto ban on discussing the personal behavior of scientists. I agree that the personal life of scientists is off limits. But their professional life shouldn’t be. When Bernie Madoff fabricated gains of $65 billion it was certainly legitimate to criticize him personally. Imagine if that was taboo, and instead only the technical aspects of his Ponzi scheme were acceptable material for public debate. That would be a terrible idea for the finance industry, and so it should be for science. Science is not special among the professions, and frankly, the people who practice it hold no primacy over others. I therefore believe it is not only acceptable but imperative to critique the professional behavior of persons who are scientists. I also think that doing so will help eliminate the problematic devil–saint dichotomy that persists with the current system. Having developed a culture in which personal criticism is outlawed in scientific conversations while only science is fair fodder for public discourse, we now have a situation where scientists are all presumed to be living Gods, or else serious criminals to be outlawed and banished from the scientific community. Acknowledging that there ought to be a grey zone, and developing a healthy culture where critique of all aspects of science and scientists is possible and encouraged would relieve a lot of pressure within the current system. It would also be more fair and just. I wish the authors of the KBL paper would publish the reviews of their paper on this blog. BUT, one of the top math departments in the world, the math department at the Massachusetts Institute of Technology is ranked #11… they didn’t even make the top ten. Even more surprising is the entry at #7 that I have boldfaced: the math department at King Abdulaziz University (KAU) in Jeddah, Saudi Arabia. I’ve been in the math department at Berkeley for 15 years, and during this entire time I’ve never (to my knowledge) met a person from their math department and I don’t recall seeing a job application from any of their graduates… I honestly had never heard of the university in any scientific context. I’ve heard plenty about KAUST (the King Abdullah University of Science and Technology ) during the past few years, especially because it is the first mixed-gender university campus in Saudi Arabia, is developing a robust research program based on serious faculty hires from overseas, and in a high profile move hired former Caltech president Jean-Lou Chameau to run the school. But KAU is not KAUST. A quick google searched reveals that although KAU is nearby in Jeddah, it is a very different type of institution. It has two separate campuses for men and women. Although it was established in 1967 (Osama Bin Laden was a student there in 1975) its math department started a Ph.D. program only two years ago. According to the math department website, the chair of the department, Prof. Abdullah Mathker Alotaibi, is a 2005 Ph.D. with zero publications [Update: Nov. 10: This initial claim was based on a Google Scholar Search of his full name; a reader commented below that he has published and that this claim was incorrect. Nevertheless, I do not believe it in any way materially affect the points made in this post.] This department beat MIT math in the USNWR global rankings! Seriously? In 2011 Yudhijit Bhattacharjee published an article in Science titled “Saudi Universities Offer Cash in Exchange for Academic Prestige” that describes how KAU is targeting highly cited professors for adjunct faculty positions. According to the article, professors are hired as adjunct professors at KAU for $72,000 per year in return for agreeing (apparently by contract) to add KAU as a secondary affiliation at ISIhighlycited.com and for adding KAU as an affiliation on their published papers. Annual visits to KAU are apparently also part of the “deal” although it is unclear from the Science article whether these actually happen regularly or not. Hope this email finds you in good health. Thank you for your interest. “Distinguished Adjunct Professor” at KAU. terminate its association with one month prior notice. 2. The Salary per month is $ 6000 for the period of contract. funded (up to $100,000.00) projects. external funded project by different agencies in Saudi Arabia. 8. May submit an international patent. web site to include your employment and affiliation with KAU. The publication of the Science article elicited a strong rebuttal from KAU on the comments section, where it was vociferously argued that the hiring of distinguished foreign scholars was aimed at creating legitimate research collaborations, and was not merely a gimmick for increasing citation counts. Moreover, some of the faculty who had signed on defended the decision in the article. For example, Neil Robertson, a distinguished graph theorist (of Robertson-Seymour graph minors fame) explained that “it’s just capitalism,” and “they have the capital and they want to build something out of it.” He added that “visibility is very important to them, but they also want to start a Ph.D. program in mathematics,” (they did do that in 2012) and he added that he felt that “this might be a breath of fresh air in a closed society.” It is interesting to note that despite his initial enthusiasm and optimism, Professor Robertson is no longer associated with KAU. In light of the high math ranking of KAU in the current USNWR I decided to take a closer look at who KAU has been hiring, why, and for what purpose, i.e. I decided to conduct post-publication peer review of the Bhattacharjee Science paper. A web page at KAU lists current “Distinguished Scientists” and another page lists “Former Distinguished Adjunct Professors“. One immediate observation is that out of 118 names on these pages there is 1 woman (Cheryl Praeger from the University of Western Australia). Given that KAU has two separate campuses for men and women, it is perhaps not surprising that women are not rushing to sign on, and perhaps KAU is also not rushing to invite them (I don’t have any information one way or another, but the underrepresentation seems significant). Aside from these faculty, there is also a program aptly named the “Highly Cited Researcher Program” that is part of the Center for Excellence in Genomic Medicine Research. Fourteen faculty are listed there (all men, zero women). But guided by the Science article which described the contract requirement that researchers add KAU to their ISI affiliation, I checked for adjunct KAU faculty at Thomson-Reuters ResearcherID.com and there I found what appears to be the definitive list. Although Neil Robertson has left KAU, he has been replaced by another distinguished graph theorist, namely Carsten Thomassen (no accident as his wikipedia page reveals that “He was included on the ISI Web of Knowledge list of the 250 most cited mathematicians.”) This is a name I immediately recognized due to my background in combinatorics; in fact I read a number of Thomassen’s papers as a graduate student. I decided to check whether it is true that adjunct faculty are adding KAU as an affiliation on their articles. Indeed, Thomassen has done exactly that in his latest publication Strongly 2-connected orientations of graphs published this year in the Journal of Combinatorial Theory Series B. At this point I started having serious reservations about the ethics of faculty who have agreed to be adjuncts at KAU. Regardless of the motivation of KAU in hiring adjunct highly cited foreign faculty, it seems highly inappropriate for a faculty member to list an affiliation on a paper to an institution to which they have no scientific connection whatsoever. I find it very hard to believe that serious graph theory is being researched at KAU, an institution that didn’t even have a Ph.D. program until 2012. It is inconceivable that Thomassen joined KAU in order to find collaborators there (he mostly publishes alone), or that he suddenly found a great urge to teach graph theory in Saudi Arabia (KAU had no Ph.D. program until 2012). The problem is also apparent when looking at the papers of researchers in genomics/computational biology that are adjuncts at KAU. I recognized a number of such faculty members, including high-profile names from my field such as Jun Wang, Manolis Dermitzakis and John Huelsenbeck. I was surprised to see their names (none of these faculty mention KAU on their websites) yet in each case I found multiple papers they have authored during the past year in which they list the KAU affiliation. I can only wonder whether their home institutions find this appropriate. Then again, maybe KAU is also paying the actual universities the faculty they are citation borrowing belong to? But assume for a moment that they aren’t, then why should institutions share the credit they deserve for supporting their faculty members by providing them space, infrastructure, staff and students with KAU? What exactly did KAU contribute to Kilpinen et al. Coordinated effects of sequence variation on DNA binding, chromatin structure and transcription, Science, 2013? Or to Landis et al. Bayesian analysis of biogeography when the number of areas is large, Systematic Biology, 2013? These papers have no authors or apparent contribution from KAU. Just the joint affiliation of the adjunct faculty member. The limit of the question arises in the case of Jun Wang, director of the Beijing Genome Institute, whose affiliations are BGI (60%), University of Copenhagen (15%), King Abdulaziz University (15%), The University of Hong Kong (5%), Macau University of Science and Technology (5%). Should he also acknowledge the airlines he flies on? Should there not be some limit on the number of affiliations of an individual? Shouldn’t journals have a policy about when it is legitimate to list a university as an affiliation for an author? (e.g. the author must have in some significant way been working at the institution). Another, bigger, disgrace that emerged in my examination of the KAU adjunct faculty is the issue of women. Aside from the complete lack of women in the “Highly Cited Researcher Program”, I found that most of the genomics adjunct faculty hired via the program will be attending an all-male conference in three weeks. The “Third International Conference on Genomic Medicine” will be held from November 17–20th at KAU. This conference has zero women. The same meeting last year… had zero women. I cannot understand how in 2014, at a time when many are speaking out strongly about the urgency of supporting females in STEM and in particular about balancing meetings, a bunch of men are willing to forgo all considerations of gender equality for the price of ~$3 per citation per year (a rough calculation using the figure of $72,000 per year from the Bhattacharjee paper and 24,000 citations for a highly cited researcher). To be clear I have no personal knowledge about whether the people I’ve mentioned in this article are actually being paid or how much, but even if they are being paid zero it is not ok to participate in such meetings. Maybe once (you didn’t know what you are getting into), but twice?! 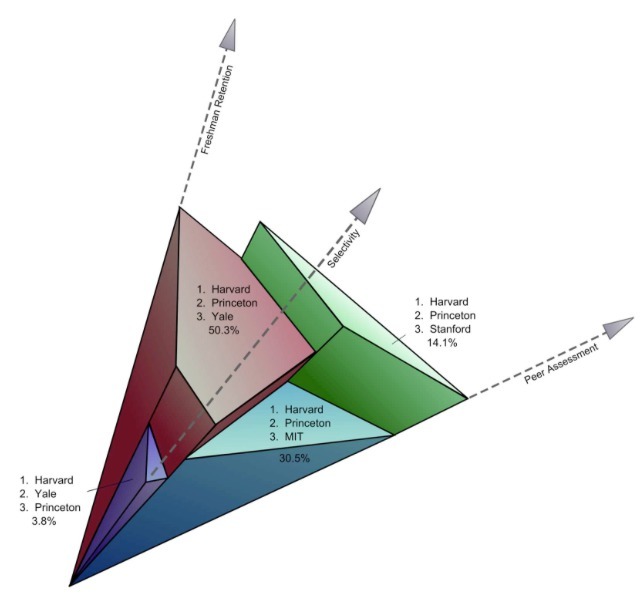 P. Huggins and L.P., Selecting universities: personal preferences and rankings, arXiv, 2008. It exists only as an arXiv preprint as we never found a suitable venue for publication (this is code for the paper was rejected upon peer review; no one seemed interested in finding out the extent to which the data behind rankings can produce a multitude of stories). The article addresses a simple question: given that various attributes have been measured for a bunch of universities, and assuming they are combined (linearly) into a score used to produce rankings, how do the rankings depend on the weightings of the individual attributes? The mathematics is that of polyhedral geometry, where the problem is to compute a normal fan of a polytope whose vertices encode all the possible rankings that can be obtained for all possible weightings of the attributes (an object we called the unitope). An example is shown below, indicating the possible rankings as determined by weightings chosen among three attributes measured by USNWR (freshman retention, selectivity, peer assessment). It is important to keep in mind this is data from 2007-2008. Our paper had an obvious but important message: rankings can be very sensitive to the attribute weightings. Of course some schools such as Harvard came out on top regardless of attribute preferences, but some schools, even top ranked schools, could shift by over 50 positions. Our conclusion was that although the data collected by USNWR was useful, the specific weighting chosen and the ranking it produced were not. Worse than that, sticking to a single choice of weightings was misleading at best, dangerous at worse. I was reminded of this paper when looking at the math department rankings just published by USNWR. When I saw that KAU was #7 I was immediately suspicious, and even Berkeley’s #1 position bothered me (even though I am a faculty member in the department). I immediately guessed that they must have weighted citations heavily, because our math department has applied math faculty, and KAU has their “highly cited researcher program”. Averaging citations across faculty from different (math) disciplines is inherently unfair. In the case of Berkeley, my applied math colleague James Sethian has a paper on level set methods with more than 10,000 (Google Scholar) citations. This reflects the importance and advance of the paper, but also the huge field of users of the method (many, if not most, of the disciplines in engineering). On the other hand, my topology colleague Ian Agol’s most cited paper has just over 200 citations. This is very respectable for a mathematics paper, but even so it doesn’t come close to reflecting his true stature in the field, namely the person who settled the Virtually Haken Conjecture thereby completing a long standing program of William Thurston that resulted in many of the central open problems in mathematics (Thurston was also incidentally an adjunct faculty member at KAU for some time). In other words, not only are citations not everything, they can also be not anything. By comparing citations across math departments that are diverse to very differing degrees USNWR rendered the math ranking meaningless. Some of the other data collected, e.g. reputation, may be useful or relevant to some, and for completeness I’m including it with this post (here) in a form that allows for it to be examined properly (USNWR does not release it in the form of a table, but rather piecemeal within individual html pages on their site), but collating the data for each university into one number is problematic. In my paper with Peter Huggins we show both how to evaluate the sensitivity of rankings to weightings and also how to infer bounds on the weightings by USNWR from the rankings. It would be great if USNWR included the ability to perform such computations with their data directly on their website but there is a reason USNWR focuses on citations. I hope this post frightened you. It should. Happy Halloween!